If you're a long time reader, you'll remember my weekly feature Friday Faves from a couple of years back, where I used to share inspirational homes from Instagram. Last week it made its long-awaited return with some beautiful living rooms, and this week I'm nosing at some inspirational kitchens! 1. First up today is this high-spec modern beauty from @ournewbuildjourney - what a big, bright space! Those under unit spotlights add so much extra light, and is a great way of bouncing light off the white glossy cupboards/tiles/floor, making any room seem bigger and brighter. I love the simplicity of the styling too, those clear work surfaces give such an uncluttered and spacious feel. 2. I mean I don't even know where to start with this one to be totally honest - everything here is just beyond dreamy, don't you agree?! Sophie (@bricksandthebairns) is a very recent find for me (literally last night! ), but if you're a fan of country-style cottages then this really is the account for you. 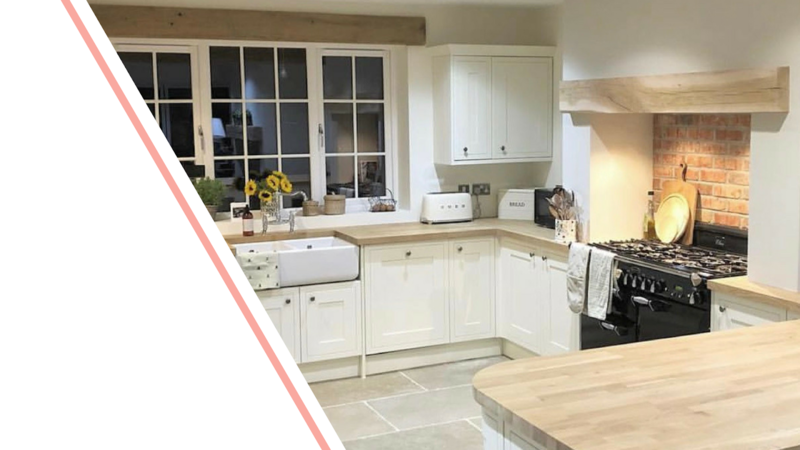 I can only dream of owning a kitchen like this one day: butlers sink, range cooker, oak worktops - this kitchen really has it all! And would you believe this home is a self-build?! So inspirational, I can't wait to follow along with Sophie's home journey. 3. I'm a huge fan of Debbie's (@mrsdebclark) absolute beauty of a kitchen - she's gone for my dream grey shaker-style units with that quartz worktop! Also how beautiful is that jug? She's inspiring me to start a brand new pottery collection! If you're a fan of rabbits too you definitely need to hop (get it?! Sorry) over and give Debbie a follow, as she's got the two sweetest house bunnies. 4. I've been following the lovely Jill (@homeatrosecottage) for a while now, and she has such a fun, inspirational account. How lovely is her kitchen for a start? What a gorgeous big space, and she's a fellow Emma Bridgewater fan, so its worth having a nose at her account just for her beautiful collection alone. 5. Allanah (@allanahjac) is currently renovating her beautiful period home on the Orkney Islands, and if you’re a fan of neutrals and a minimalist scandi style, then she’s a must-follow. She transformed this kitchen on a tight budget (go over and have a look at the before pics!) - how beautiful is it now?! She’s given me some serious inspiration for (hopefully) transforming ours soon too. 6. Well how flipping gorgeous is this?! I call that a dream Emma Bridgewater collection if I ever saw one! The colour of Tracy’s (@thechimneypot) dresser is just the perfect statement for this room isn’t it, and I love how she’s styled it simply with some greenery and vintage accessories. With such a large collection it would be really easy for this corner to look busy and cluttered, but there’s exactly the perfect amount of beautiful bits on show here. 7. Katie (@heart_of_your_home_kitchens) is a kitchen designer (dream job, or what?!) and has shared this absolute stunner she worked on for a client – just look at that AGA of dreams! How amazing is that beautiful big clock too, the perfect statement piece to finish off this room. Katie’s got so many inspirational kitchens of different styles and sizes over on her feed, so if you’re thinking of starting a renovation I would definitely pop over and have a nose. 8. I've previously written a whole feature on this stunner of a kitchen (have a read & nose at loads more pics here), but it wouldn't be kitchen week without including Jacqui (@home_is_hillcrest) would it?! This kitchen renovation is one of my favourite ever - just look at all that beautiful space! You can just imagine how amazing those bi-fold doors have been over the past few weeks can't you - total kitchen and garden goals. 9. And finally, I shared Laura's (@laurakateelvis) living room last week, however couldn't resist sharing this cool storage idea from her kitchen too. I love this crate used a shelf, a really clever way of adding a rustic touch to any kitchen. How cute is that chalkboard sign on that pasta jar too?! Next week I want to see your inspirational bathrooms! If you'd like to enter your home use the hashtag on Instagram #dovecottagefridayfaves on photos of your kitchen, and I'll share as many as I can next Friday. Some of these kitchens are jaw dropping - look away now before you get major kitchen lust haha! Some seriously gorgeous kitchens here. Instagram is ace for that! My dream kitchen is Jacqui's! I LOVE the dark hues and the modern extension! What a lovely post and so great to share your Insta finds. My favourite is also Jacqui's. Those huge doors and all that space and light....just dreamy! Such lovely kitchens here but I particularly like Jacqui's mixture of traditional and contemporary styles... oh and all that fab natural light!